Place a large Dutch oven over medium heat and cook the bacon until the fat is rendered and it crisps up. Remove the bacon and set aside. Pour off all but one tablespoon of the fat and add the butter. Once the butter has melted, place the chicken breast side down in the pot. Let the chicken brown for 12-15 minutes, reducing the heat to medium low if the butter becomes too brown. Carefully turn the chicken over using a set of tongs. Brown the other side for an additonal 12-15 minutes. Remove the chicken and set aside. Pour off all the fat that remains in the pot. 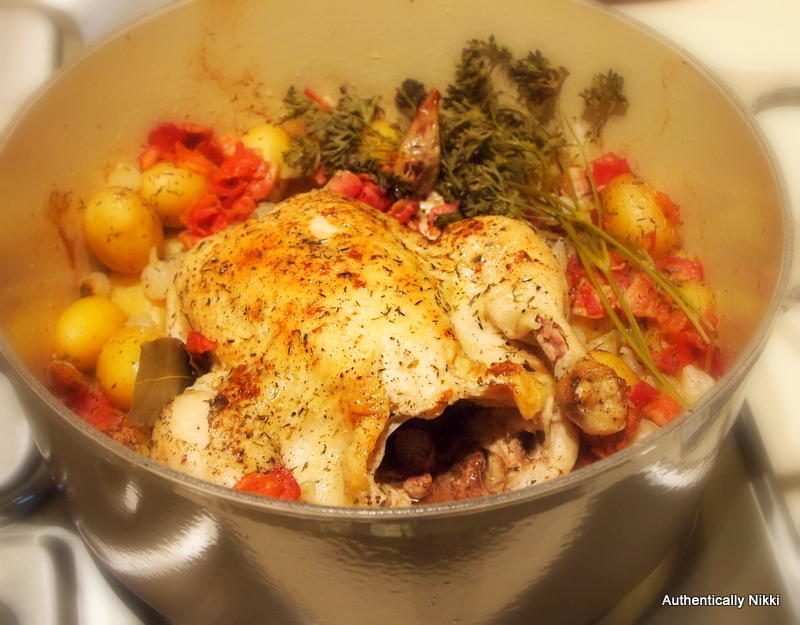 Place the chicken into the middle of the Dutch oven breast side up. Add the potatoes around the outside of the chicken in an even layer. Tuck the bay leaf in-between some of the potatoes. Place the bacon, pearl onions and parsley on top of the potatoes. Sprinkle with salt, pepper and the dried thyme. Cover the pot with a piece of aluminum foil large enough to seal the pot and then add the lid on top. Place into the preheated oven and roast for 1 hour and 10 minutes to 1 hour and 20 minutes. The chicken will be done when the juices in the cavity run clear and an instant read thermometer inserted into the thigh joint reads 165 – 170 degrees. Carefully remove the chicken from the pot and let it rest on a carving board for 10 minutes. Scoop out the vegetable into a serving dish and discard the bay leaf and parsley. Pour the liquid from the pot into a fat separator and let sit about 5 minutes. Carve the chicken into 8 – 10 pieces. Serve with the defatted pan sauce and the vegetables.